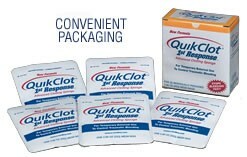 QuikClot sponges control arterial and venous bleeding. Easy application in the field or in first responder situations. Hemostatic sponge with 25 Grams of active clotting agent (.88oz.packet). Stops bleeding quickly. New cooler formula produces less heat in the clotting process. Box of 5 individual packets for five separate applications.